Who may be baptized at the Church of the Reconciliation? All people who are seeking to follow Christ and to know Christ more fully. Both adults and children are welcome to receive the sacrament of Baptism at our church. The Book of Common Prayer and the customs of the Episcopal Church guide our baptismal policies. A central part of the bond at baptism is established when the members of the parish make a promise, before God and each other, to do all in their power to support these persons in their life in Christ (BCP, p. 303). To fulfill this promise, our members must be able to develop a relationship with the persons being baptized. Therefore, we only baptize members of our parish. Newcomers who commit themselves to becoming members of our church are welcome to be baptized. Grandchildren of members may be baptized at our church if they are members of a parish in their community and their clergy are willing to work with our Pastor to ensure that the family has been prepared for the baptism and is active in the life of their local parish. Inactive members (have not attended within the past year), occasional worshipers (Christmas and Easter), as well as newcomers are most welcome to apply for Holy Baptism but should understand that Baptism involves a sacred commitment to living in Christian community with other Christians. As such, active and consistent participation in the life of our parish is expected. To schedule a baptism for you or any person in your family, please talk to the Pastor after one of the Sunday worship services or set up a weekday meeting. Please mention any special concerns or circumstances to the Pastor at that time. Baptisms occur five times a year in our parish during the principal service of Holy Eucharist. Baptisms will be held on other dates in cases of emergency or inability to attend any of the five dates listed per year. The Pastor leads a class and rehearsal for each baptism. The class and rehearsal are taught together on the Saturday before the baptism, beginning at 10 a.m. and concluding by noon. Parents of infants and children who are to be baptized must attend this class and rehearsal. Godparents are encouraged to attend, if possible. The rehearsal profoundly effects the baptism, and so, it is required that parents be available for the rehearsal and class. In this manner, we are able to include all the families for the service the next day. For inactive and new members, an individual meeting with the Rector to learn about Baptism and discuss the Christian life is also required. These meetings will be scheduled by the Rector and interested family. The Book of Common Prayer indicates that each candidate for Holy Baptism is to be sponsored by one or more baptized persons. (p. 298). 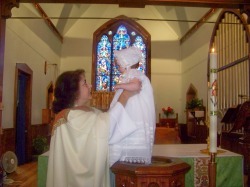 The Godparents may be any denomination or Christian faith, provided they are baptized. The Godparents function as the spiritual sponsors for the person being baptized. Godparents should serve as mentors in the Christian faith, fellow Christians who support and encourage the newly baptized throughout their entire Christian journey. Especially important to young people, the sponsors stand with the parents and essentially make the baptismal vows in the name of the baptized. As the baptized child grows, the sponsor creates a relationship with the baptized to help guide and direct the child in their relationship with God. Then, at Confirmation, the baptized child publicly confirms the vows that were made for them at baptism. Because a Godparent commits to guiding and supporting a person in their faith life, it is preferred that Godparents not be family members who already have a relationship with the newly baptized. Instead, a member of the parish, or a family friend with a deep Christian faith would be ideal.